"A Better Switchboard" is an add-in for MS Access that provides you with a collection of enhanced MS Access switchboard menus that you can use with your application. 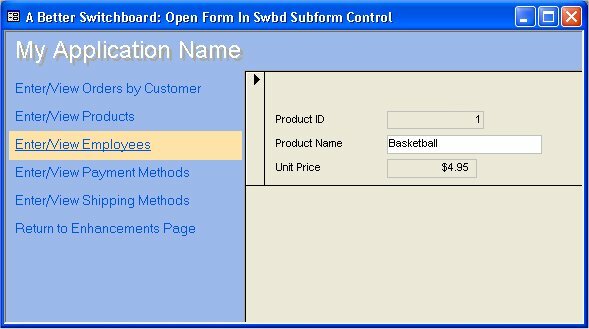 These switchboards can be used as an alternative to the standard button-menu and teal-green style switchboards that are created with the Access database wizard. The "A Better Switchboard" collection includes web-page-like menus with rollover effects, Expanding list/Treeview type menus, and different button-style menus. Also, these new switchboards provide enhanced functionality by allowing multiple parameters to be passed to a function called from a switchboard, by allowing web pages to be opened from the switchboard, and more. "A Better Switchboard" switchboards are easy to implement. You use the "Switchboard Items" table that the standard Access switchboards use. Just choose "A Better Switchboard" from the add-in menu, import one of the new switchboards into your application, open it instead of the old switchboard and you're off and running! такую шляпку, как у меня! -- Ну уж нет! Эта шляпка мне очень идет. Больше, чем ей!